Maria and Anastasia's Bedroom was next door to their sister's. 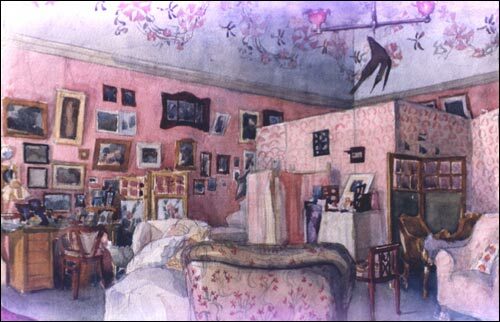 It was very similar in style, except the frieze in this room shows butterflies in roses stenciled above gray-painted walls. 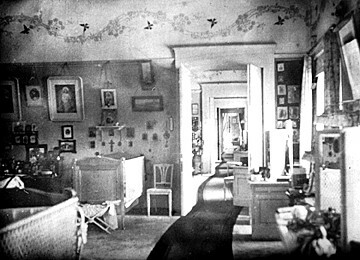 This photograph was taken when the palace was a museum; during the brief years when the children's rooms were open to the public. Immediately after the departure of the Romanovs for Siberia in August 1917 the palace was closed for a short for inventory and then a series of rooms, mostly Parade Halls, were opened to the public. At first the upstairs rooms of the Imperial children were turned into an ill-fated children's home, but the lack of heating and the inappropriateness of having kids in a museum resulted in them moving elsewhere. This short-term use of the children's rooms caused a great deal of damage. It took a considerable amount of work by museum curators and restorers to recreate the rooms. Furniture that had been either stolen by communist party officials or transferred to other uses had to be located and hopefully returned. 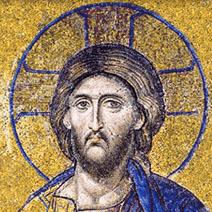 Most of the personal effects, pictures and such, had, fortunately, been placed in storage and were preserved. These items could easily be placed back in their original places through the recollections of servants and checking photographs. The rooms were then open to the public into the 1930's when they were ordered handed over to KGB officials as a kind of private weekend retreat for senior officals and the furnishings finally sold off. The beds in this picture were used by the girls when they were small children. 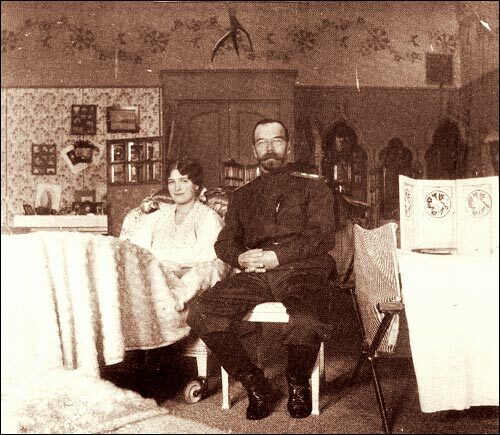 Their camp beds went with them to Tobolsk and Yekaterinburg and never returned to the palace. "Marie Nicolaevna was like Olga Nicolaevna in colouring and features, but all on a more vivid scale. She had the same charming smile, the same shape of face, but her eyes, "Marie's saucers," as they were called by her cousins, were magnificent, and of a deep dark blue. Her hair had golden lights in it, and when it was cut after her illness in 1917, it curled naturally over her head. Marie Nicolaevna, alone of the sisters, had a decided talent for drawing, and sketched quite -well, always with her left hand. "Mashka," as her sisters called her, was ruled entirely by her youngest sister, Anastasia Nicolaevna, nicknamed by her mother "the imp." 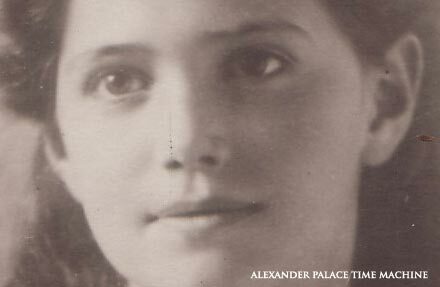 Perhaps Anastasia Nicolaevna would have grown up the prettiest of the sisters. Her features were regular and finely cut. She had fair hair, fine eyes, with impish laughter in their depths, and dark eyebrows that nearly met. These combined to make the youngest Grand Duchess quite unlike any of her sisters. She had a type of her own and was more like her mother's than her father's family. She was rather short even at seventeen, and was, then decidedly fat, but it was the fatness of youth. She would have outgrown it, as had her sister Marie. Anastasia Nicolaevna was the originator of all mischief, and was as witty and amusing as she was lazy at her lessons. She was quick and observant, with a keen sense of humour, and was the only one of the sisters who never knew the meaning of shyness. Even as a baby she had entertained grave old men, who were her neighbors at table, with her astonishing remarks.